(Please let me know if you disagree.) My understanding is that the 401(k) and IRA limits are independent, so I can put $5k into my Roth IRA, $5k into my wife's, $16.5k into my Roth 401(k), and $16.5k into my wife's Roth 401(k) if she had one. I can't imagine wanting to save more for retirement than that. How to calculate "the number"
But that brings me to my real question: How much do I need to save for retirement? I have other financial goals like saving for a house down payment that need attention. So I tried to sit down and calculate "my number" ... how much money I will need to retire "comfortably." I'm pretty handy with a spreadsheet for this kind of stuff, but there are just so many factors that by the time I'm done with my calculation I'm not even sure if it's accurate. So here is what I did. Please help me understand how I can tweak the calculation and/or where there is a good online tool. My strategy was to first calculate how much money I would have at retirement if I contributed $5000 to a Roth IRA every year until retirement. I assumed a 10-11% average yield. Of course it varies greatly depending on how long I wait to retire. This is where the first problem comes in, because when I retire might depend on how much money is in my retirement accounts. That's no biggie because my spreadsheet lets me see the estimated balance for every year, so I can evaluate my options. The second problem so far is that I haven't factored for inflation: How will contribution limits rise? How much will my money be worth in today's dollars? My next step was to calculate how long that money will last. For this I assumed an investment yield of 3-5%. (Lower yield since I will invest conservatively during retirement.) I gave myself a salary and subtracted the salary every year until all the money was gone. I also assumed a 3% inflation rate, so I gave myself a 3% raise every year. So for example, if I start investing at 27, get a 10% yield, and retire at 65 I will have $2,116,952. Then if I get a 3% yield and give myself a 3% raise with a $70k starting salary, my money will last until I am 96. Not bad. Should I increase the annual contribution somehow? Should I use different estimated yields? Am I just way off? save at least 10% of your income, but 15% is better. Your savings rate will need to cover everything (retirement, emergencies, houses, cars, kids) and 10% probably isn't good enough for that. retirement or home downpayment first is sort of a personal call, in my opinion. how soon do you want to own a house? for most of us, our time is almost certainly better spent thinking about our income and career than in detailed investment planning - if you do the math, assuming you save 10-15% of whatever you make, then boosting your income 20k is worth a whole lot of money over the years. Of course if you save 0% or something close to it, then you can make a million a year and still be screwed. future government policy, for example will you get Medicare / Social Security and how much, tax rates, etc. There are some really complex calculators out there, for example see ESPlanner (http://www.esplanner.com/) (caution: horrible user interface, but seemed to work), that will include all kinds of factors and run monte carlo and the whole thing. But in my opinion, it's just as good or better to say save at least 15% of income until you have 25x what you spend, or some other such rule of thumb. Another note, there's sort of an "ideology of how to live" embedded in any retirement recommendation, and you might want to take the time to reflect on that and consciously choose. A book on this topic is Your Money or Your Life by Robin & Dominguez, http://www.amazon.com/Your-Money-Life-Transforming-Relationship/dp/0143115766 which is a sort of radical "you should save everything possible to achieve financial independence as early as possible" argument. I didn't go for their plan, but I think it's thought-provoking. A newer book that may be more appealing is called The Number and it's about your question exactly. It's more designed to get you thinking, while Your Money or Your Life has a particular answer in mind. Both have some math and some rules of thumb, though they aren't focused on that. A kind of general takeaway from these books might be: first think about your expenses. What are you trying to accomplish in life, how would you like to spend your time? And then ask how much money you absolutely need to accomplish that, and focus on accomplishing your goals, spending your time (as much as you can) on what you'd like to spend it on. I'm contrasting this with a generic recommendation to save enough to spend 80% of your income in retirement, which embeds this idea that you should spend as much as possible every year, before and after you retire. Lots of people do like that idea, but it's not a law of the universe or something, it's just one popular approach. I'm concerned about your extreme focus on Roth. In today's dollars it would take nearly $2 million to produce enough of an annual withdrawal to fill the 15% bracket. If you are able to fund both 401(k)s and 2 IRAs (total $43K) you're clearly in the 25% bracket or higher. If you retire 100% with Roth savings, and little to no pretax money, you miss the opportunity to receive withdrawals at zero(1), 10, and 15% brackets. Missing this isn't much better than having too much pretax and being in a higher bracket at retirement. One factor often overlooked is that few people manage a working life with no gaps. During times when income is lower for whatever reason, it's a great time to convert a bit to Roth. (1)by zero bracket, I mean the combined standard deduction and exemptions. For two people this is currently (for 2018) $24,000 total. And it goes up a bit most years. How will contribution limits rise? Contribution limits are raised based on COLA. COLA (Cost of Living Adjustment) is a number based on CPI (Consumer Price Index) which is published by the Bureau of Labor Statistics. The IRS publishes these limits annually and a simple search term to find them each year is "415 limits" because section 415 lists how much the various qualified plans can set aside each year. CPI is a heavily managed and very political number. It is the number that is cited when the media talks about "inflation." Since it drives increases in salaries, deductions, Social Security and pension payments, there is very heavy pressure to keep the number smaller than it really is. One traditional rule-of-thumb is to withdraw 4% of your balance each year. Another alternative is to purchase annuities. While younger people think that annuities are horrible investments, they appeal to older people because they protect the annuitant from excessive risk of losing your capital. When you are 30, and another 2008 comes along wiping out half your savings, you have time to re-earn that money. When you are 60, and another 2008 comes along wiping out half your savings, you have very few years to recover that money. So an annuity pushes that risk onto insurance companies. If you think you will die in your 90s, then an annuity is going to be a good investment (the insurance company will be betting that you won't be living that long). I have a simple spreadsheet that I use to calculate estimated projected balances and compare them to actual performance. Don't forget that when you reach 50, the amount you can contribute goes up due to "catch up contributions." There are 2 views of the same tab in this picture. There are 3 growth rates: pessimistic, nominal and optimistic. You can change the numbers to suit your own projections of future growth. 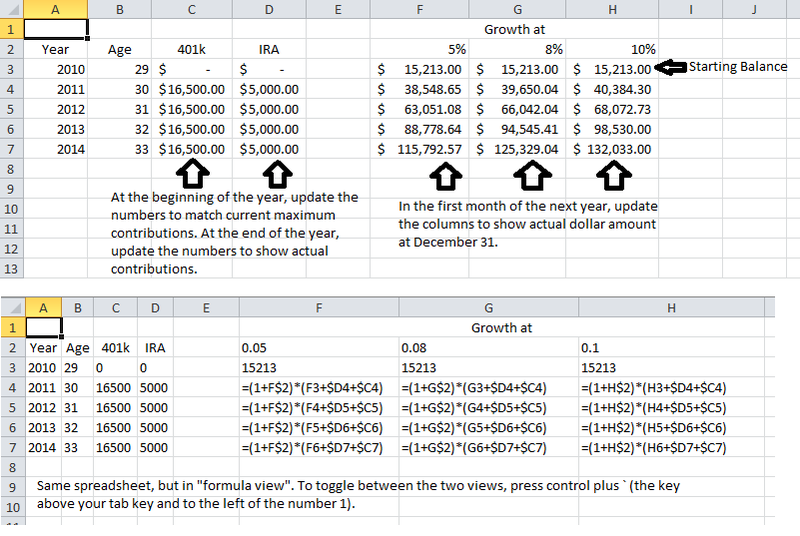 Other tabs on this spreadsheet include measurements of actual performance by my 401k and IRA accounts. At the end of the year, I replace the numbers in columns F, G & H with the actual end-of-year dollar amounts. This way, future estimates do not get too far unhinged from reality. If you need more sophisticated planning, such as Monte Carlo analysis to attempt to cope with inflation, I recommend the book Engineering Your Retirement. The book is aimed at younger engineers, so there is a bit more math than the average person would want. Not the answer you're looking for? Browse other questions tagged united-states ira savings retirement roth-ira or ask your own question. What size “nest egg” should my husband and I have, and by what age? Is the new myRA retirement savings account option worth it?